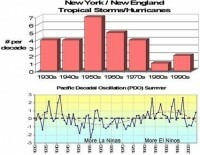 Since 1995, the Atlantic has become twice as active on average as the prior 25 years, similar to the period from 1930s to 1960s. 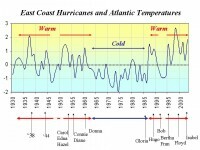 This is due to a shift to the “warm” mode of the multi-decadal scale oscillation in the Atlantic Ocean Most of the storms making landfall during the past 12 years have impacted the Mid-Atlantic region, Florida and the Gulf of Mexico. However, though not yet realized, history tells us that the risk has also increased for more populated areas to the north New York City/(Long Island and New England). It appears the Pacific plays a role too. The cold mode of the PDO (in place this summer) favors New York and New England landfalls in large part because it favors La Nina. We had a strong La Nina this past winter into the early spring but it has in recent months, warmed in the eastern tropical Pacific. It is unclear whether that will save the east coast and the northeast one more year. See what would happen if a hurricane of ‘38 were to repeat or worse yet land a direct hit on New York City here. Included are storm surge animations. A CAT 3 storm on such a track could be a $100 billion storm. A track more to the east into southeastern New England would do a lot of damage to the expensive real estate and commercial properties that have exploded across the areas after the last major hurricane (Carol) hit in 1954. 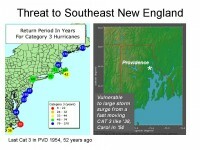 Read more about a southeastern New England hit here. 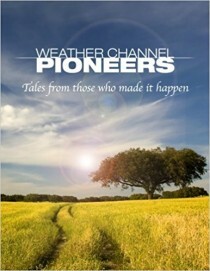 The media would of course blame such a storm on global warming even though there have been similar storms recorded ever since America was first settled. The unprecedented cost would be the result of the explosive growth of the population in these attractive but vulnerable areas. 80% of the population in the northeast have never experienced a major hurricane. Everyone has seen on television the results of recent major storms like Katrina but many believe we can’t get a storm like that in the northeast. History says otherwise.